The prosecutor’s office has estimated that two Petersburg parks sustained 10.9 million rubles [approx. 144,000 euros] in damage during the He’s Not Our Tsar protest, which took place on May 5, 2018, in Petersburg [and other Russian cities]. Two people, Denis Mikhailov and Bogdan Livtin, will be held responsible for all the protesters, police officers, and ordinary Petersburgers who walked on the lawns that day in the vicinity of Palace Square. Law enforcement agencies have identified the two men as organizers of the protest rally. Suing for damage to municipal property is the Russian state’s new know-how when it comes to intimidating the opposition. Like certain other innovations, for example, repeated arrests for involvement in the same protest rally, it is being tried out on Alexei Navalny’s supporters. The authorities decided to start big. The prosecutor’s office has estimated the city suffered nearly 11 million rubles in damage from the He’s Not Our Tsar rally. According to members of the Navalny Team in Petersburg, the 300-page complaint claims opposition protesters damaged the greenery in the Alexander Garden and the garden next to the Winter Palace. Allegedly, they trampled the lawns, flower beds, and roses, and damaged the dogwood and lilac bushes. The complaint states the cost of restoring the vegetation in the two green spaces, as provided by the city’s municipal amenities committee. According to the committee, it cost 3,651,000 rubles [approx. 48,000 euros] to repair the damage incurred by the May 5 rally. The prosecutor’s office multiplied this amount by three, citing a municipal regulation on the amount of compensation to be paid when greenery has to be replaced. The regulation states the amount of damage caused to green spaces protected by the city’s Committee on the Use and Preservation of Landmarks (KGIOP) must be multiplied by a factor of three. 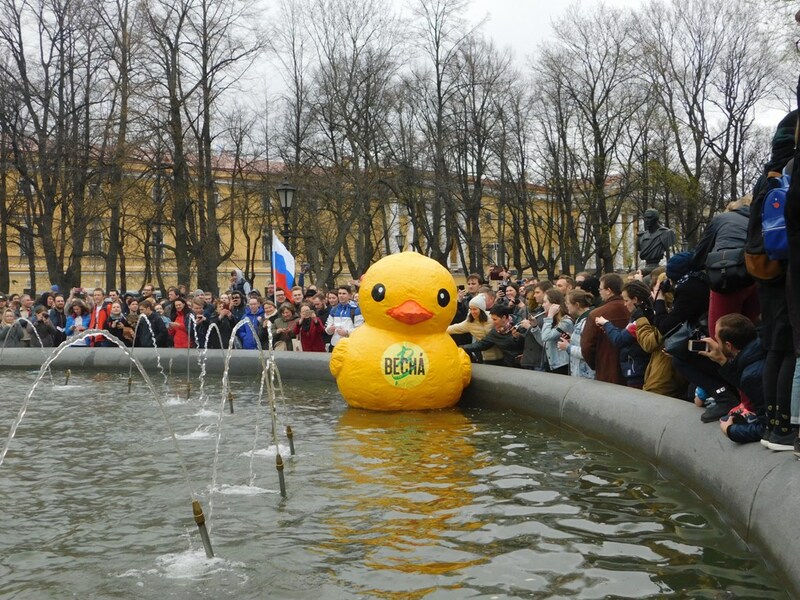 A giant rubber duck emblazoned with the logo of the Vesna (“Spring”) Movement floats in a fountain in the Alexander Garden on May 5, 2018. Ivan Pavlov, lawyer and head of Team 29, a group of civil rights lawyers, fears the lawsuit against Litvin and Mikhailov is only the first of similar penalties. “I am concerned by the direction the prosecutor’s office has taken. This would set a very dangerous precedent. Precedents are usually tried out in other regions of the country, but this time they are starting with Petersburg. Fines are one thing, but civil liability is a whole new level of impacting people’s desire to protest,” Pavlov told Zaks.ru. Leonid Volkov, project manager at the Anti-Corruption Foundation (FBK), argues that if you follow the Petersburg prosecutor’s thinking to its logical conclusion, you could also punish the organizers of authorized rallies. “If they tell us that the rally organizer should be punished for trampling the law rather than the person who trampled the lawn, it makes no difference whether the rally was authorized or not, right? Let’s imagine we have organized an authorized rally. The prosecutor shows up and tells us organizers he is suing us for a billion rubles. It would sound completely insane,” Volkov said. Downtown Petersburg is often used as a venue for large-scale events, including official celebrations. For example, this past summer, the Smolny reported that, during the annual Crimson Sails celebration for school leavers, when young Petersburgers and out-of-towners party all night long, approximately 600 cubic meters of rubbish were removed from the downtown area. It is unknown whether the city inspected the condition of its bushes after the school leavers’ party. Litvin, federal coordinator and press secretary for the Vesna Movement, actually applied to the Smolny for permission to hold the May 5 rally. He proposed a march down Zagorodny Prospect, following by a rally on Pioneer Square. The city’s law and order committee found a reason to turn down his application, just like the other applications submitted by Navalny supporters. The city told the opposition to hold its rally in Udelny Park, a large green space in the north of the city that looks more like a forest. Insulted by this suggestion, Navalny supporters announced the rally would take place on Palace Square. Three months later, on August 2, the October District Court fined Litvin 20,000 rubles for organizing the unauthorized He’s Not Our Tsar protest rally per Article 20.2 Part 1 of the Administrative Offense Code. Petersburg City Court subsequently overturned the lower court’s ruling. The case will be reheard in the near future. Mikhailov, the Navalny Team’s Petersburg coordinator, has already been punished twice for the May protest. First, the Smolny District Court sentenced him to 25 days in jail, and then the October District Court fined him 300,000 rubles [approx. 4,000 euros], a record fine for opposition political activism in Petersburg. The fact that Mikhailov was on the air on the internet channel Navalny Live during the event, answering the questions of his comrades in Moscow, was considered proof he organized the protest. “I was covering the event, because the major national media were not there. At such a huge event! In Petersburg, 10,000 people marched on the Nevsky,” replied Mikhailov. He now recalls an interesting conversation he had on the sidelines of one of his court hearings. “There was a certain law enforcement officer at one of my court hearings. He told me the prosecutor’s office was planning to file suit, because the damages incurred by the city were too large. Nothing came of it. Judging by the complaint, this past summer, they really did carry out inspections and corresponded on the matter, but then it fizzled out. But in November, when Alexander Beglov was appointed acting governor [of Petersburg], the officials involved resumed their correspondence and the lawsuit was drawn up. Putting it simply, Beglov came to power and gave them the green light,” Mikhailov told Zaks.ru. Maxim Reznik, a member of the St. Petersburg Legislative Assembly, has also noticed the new governor’s shadow looming over the lawsuit. Reznik argues the Smolny is using such cases to intimidate the opposition in the run-up to the 2019 elections. “They strike us with the lash, and they hit us in our pocketbooks. It’s directly connected with the new governor. Because he is either involved in what is happening or he has no control of the situation. Why he would want that? The regime is showing us its teeth. It doesn’t want there to be any protests whatsoever. [Beglov] needs things to be quiet so he can bring happiness to the city, while anyone who intends to agitate the people should know their place,” said Reznik. Maybe ten thousand people did not attend the May 5 protest, but there were clearly more than two thousand people on the streets, as was claimed by the Interior Ministry’s local office. Originally, no one had planned to march on Nevsky Prospect. 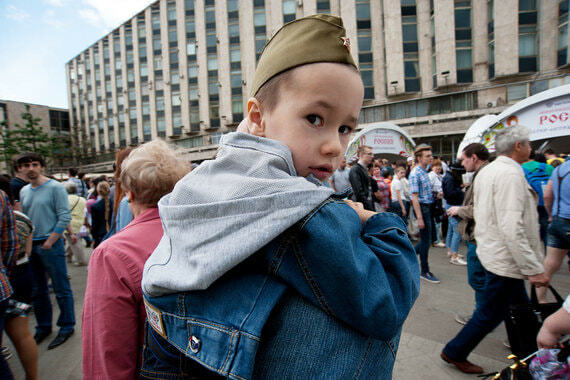 Since a celebration for bikers and rehearsals for the May 9 Victory Day military parade were taking place on Palace Square, the protest rally was hastily moved across the street to the Alexander Garden. When the Alexander Garden was teeming with people who wanted to express their displeasure at the policies of the old-new president, Vladimir Putin, voices in the crowd called for the rally to move to the Nevsky, and people spontaneously rushed into the city’s main street. The Navalny Team did not immediately join the march. Initially, the rally’s Telegram channel broadcast requests not to heed people urging protesters to leave the Alexander Garden. Volunteers sporting “20!8” pins made the same request in person, until they realized there was no holding people back. The crowd stayed on the sidewalk for awhile, but when it encountered a segment of the Nevsky closed to traffic for repairs, it went onto the roadway. At approximately the same time, Mikhailov, who was in the midst of the crowd, went on the air on Navalny Live. The first arrests occurred at the corner of Marat Street and Nevsky, where a police barrier awaited the demonstrators. Seeing what happened, the bulk of the crowd turned around and headed in the opposite direction, walking down the Nevsky and parallel streets. In none of the court hearings in the cases of Litvin and Mikhailov was any evidence presented that suggested either of the men had encouraged the demonstrators to return to Palace Square. Most of the arrests took place outside the Hermitage. Police dressed in riot gear gave chase over the lawns to anyone chanting slogans. They caught some of these people, dragging or escorting them to paddy wagons parked on Palace Passage. The proceedings were videotaped and photographed by bloggers and reporters. No one had the time to look where they were walking. Two men, however, will be held liable for damaging the lawns and other vegetation. One of them, Litvin, never even made it back to the Winter Garden: he was detained near Gostiny Dvor when the demonstrators headed in the opposite direction. Attorney Arkady Chaplygin call this method of singling out guilty parties a supernatural stupidity. “The lawsuit makes no sense whatsoever. The Russian Civil Code prohibits seeking monetary compensation for damage from persons who did not cause the damage. The law requires the individual who caused the damage to be identified. This lawsuit is a PR stunt on the part of Governor Beglov meant to intimidate the opposition. It is a stupidity supernatural in its scope,” argued Chaplygin. The Frunze District Court will try and make sense of the botany of the city’s parks and the prosecutor’s arithmetic after the New Year’s holidays. A preliminary hearing in the case has been scheduled for January 10. Yale has an incredibly rich extracurricular life. Every evening is chockablock with special events, public lectures, round tables, debates, and so on. Many politicians and public figures consider it an honor to speak at Yale. Today, for example, the president of Ghana is going to be lecturing, and there is nothing exotic about it. All these events fight for an audience. They are advertised in a variety of mailings, and the bulletin boards on campus are densely crammed with flyers. I had never seen such a popular event here. It was standing room only. Audience members (students, professors, researchers, etc.) sat on the steps of the lecture hall and stood in the aisles. There were around three hundred people. And no, I could not resist my curiosity, either. I was really interested in how Channel One operated when it was exported. On stage was the ageless Vladimir Pozner. Would that everyone looked like that at eighty-four! His speech and manners were flawless. His manner of interacting with the audience was impeccable. He joked when it was appropriate and answered questions quickly. He was a professional of the highest class. Putin extended a helping hand after 9/11, but it was rejected. The first proposal Putin made when he was elected to the presidency in 2000 was that Russia should join NATO. He was mortally offended by NATO’s rejection of his offer. He fully voiced this resentment in his 2007 Munich speech, and the resentment was justified. The western media have portrayed Putin in a negative light, all but comparing him with Hitler. This treatment has been wholly undeserved. By offending and attacking Putin, they naturally angered him and made him what he is. The media are to blame for this (sic). Did Russia meddle in the 2016 US presidential election? [Pozner’s response was that] the Russian regime cheered for Trump, naturally, because Hillary Clinton had said so many bad things about Putin, but Pozner had seen no proof of meddling. Besides, had America not meddled in elections the world over? Moreover, [the tone of the Pozner’s speech was captured] in the very first words [out of Pozner’s mouth]. Was international law violated? Yes, it was, but Sevastopol is a city populated by Russian naval officers and sailors. How could Russia have allowed the possibility of losing its naval base there and having it replaced by a NATO base, by the US Sixth Fleet? Should international law not be disregarded in such circumstances? Besides, Crimea has always been part of Russia. Finally, [Pozner told his listeners, they] would understand better what had happened in Crimea if [they] imagined what would happen if a revolution occurred in Mexico (sic). In this case, would the US not want to deploy several army divisions on its southern border? Yes, a new referendum should probably be held in Crimea, but [Pozner] was absolutely certain of the referendum’s outcome. Pozner equated Putin and Russia, of course, in all his remarks. “It was clear the Russians had to respond in a certain way,” he would say in reference to actions taken by Putin. But despite his best efforts, Pozner portrayed Putin as a rather pitiful man: insecure, petty, and vindictive. In this sense, of course, Pozner did not lie. Two completely different stories in two different Petersburg media outlets, Fontanka.ru and Rosbalt, fused into one after I read them. Rosbalt looked at the early years of Yevgeny Prigozhin, the same guy who not only is in charge of feeding the president and siphons off many billions of rubles from food supply contracts to the Defense Ministry but also privately, as it were, runs unofficial military operations outside Russia. He has the blood of many hundreds of our boys on his hands, boys who died in Syria and other places where they had no business being. Prigozhin was a wild young man. He was several times convicted of theft, robbery, and assault, topping it off with thirteen years in a maximum-security prison. Fontanka.ru continued its investigation of the series of foreign travel passport numbers that included the passports held by “Petrov” and “Boshirov,” the two Russian men recently implicated in the poisoning of the Skripals. It has transpired that a good number of people whose passport numbers differ from those of the Salisbury duo by only a couple of digits list the headquarters of the GRU (Main Intelligence Directorate) as their home address. Like “Petrov” and “Boshirov,” they are also people without pasts. Meaning that by covering for “Petrov” and “Boshirov,” our would-be intelligence wizards actually blew the cover of several dozen agents and completely torched their own network. How are these stories linked, except by the persistence of the bold Petersburg reporters who researched and wrote them? They are stories about the so-called professionalism of the so-called secret services. We are told how tough and almighty the FSO (Federal Protective Service) and FSB (Federal Security Service) are. But we saw what professionalism was worth in their case during the World Cup finals: Petya Verzilov showed the whole world what it was worth. These people, who gave a repeatedly convicted felon access to the president, are professionals? Really? What about the people who came up with the bright idea of issuing all their agents passports whose numbers were ordered sequentially. I don’t like secret services. Whatever country in the world you pick, their secret services are unprofessional parasites who only know how to puff up their cheeks and pretend to be combating nonexistent threats. At this point, someone will definitely come along and say, “But what about Israel?” I’m sorry, but with rare exceptions, perhaps, Israel has the same problem. It is simply the logical consequence of the specific nature of their work. They enjoy secrecy, meaning we cannot verify whether a threat really exists, and they are not subject to public oversight. They are heavily funded and have an incredibly broad remit, but there are no corresponding checks and balances. When the terms of their employment are such, you could hire angels to do their jobs, and after a while the angels would also be bloating their budgets and hiring more and more staff while getting nothing done whatsoever. It is the inevitable consequence of their initial portfolia and human nature. J. Edgar, a terrific serious film, and Burn After Reading, a terrific comic film, illustrate the process of degradation as it plays out in the US. I would argue that not a single country in the world has figured out what to do about it. You cannot get by without having intelligence services, but it is nearly impossible to change the conditions in which they operate. Everyone basically puts up with the inefficiency and highway robbery for the sake of a minimal albeit necessary outcome. When compared with the rest of the world, of course, our secret agents and security forces are particularly stupid loafers and especially worthless pests who achieve no positive outcomes. Leonid Volkov is project manager at Navalny’s Team. Translation and photo by the Russian Reader. The Russian Reader is a website that covers grassroots politics, social movements, the economy, and independent culture in Russia and the Russian-speaking world. It is not financed by anyone nor has it ever solicited donations. All work on the website is done for free, and no fees are paid for the Russian-language articles translated into English and posted on the site. Everything published on the Russian Reader can be reposted as long as the Russian Reader is indicated clearly as the source and a link back to the original post is included in the republication. I hadn’t come across this subject before, but it’s completely hellish. It has to do with the conveyor belt of arrests in Barnaul of people who posted memes on social networks. By the by, you read that each of these people, who has been charged with “extremism” for posting funny pictures on VK, is placed on Rosfinmonitoring’s list of people who are, allegedly, accomplices to terrorists. The list is no joke at all. All your bank accounts and bank cards are blocked, and you cannot open new accounts and get new bank cards. No one can transfer money to you. You cannot be employed anywhere. You cannot take out more than 10,000 rubles [approx. 136 euros] in cash per month from own bank account, so go ahead and live high on the hog. The kicker is that people are placed on the list without a court order. So, you are charged with a crime and you wind up on the list. I took a glance at the list: there are 8,507 people on it. Eight thousand five hundred and seven people. * The list really does include “5203. Motuznaya, Maria Sergeyevna, born 26.8.1994, Barnaul, Altai Territory.” Maria Motuznaya is the young woman who broke the story about the Center “E” officers and their informers in Altai Territory. Of course, Rosfinmonitoring could definitely not care less about the laws on personal information. While you are tortured and fined, they quietly hang you out to dry on their list. By the way, the list is called the “List of Persons about Whom There is Information of Their Involvement in Extremism or Terrorism,” and its URL is even more telling: http://www.fedsfm.ru/documents/terrorists-catalog-portal-act. So, a state agency, Rosfinmonitoring, labels 8,507 people “terrorists” just like that. It is obvious the majority of them have been placed on the list in the absence of a court ruling, because even when you take into account all the “terrorists” the FSB has dreamt up, actual terrorist cases have probably not amounted to a tenth of this number. If you’ve been added to the list, there’s no going back. The web page containing the list also features a list of people who have been removed from the list: there are fourten such people. I don’t know whether this is the number of people who have been removed from the list since it was established or over the last year. In any case, it is less than 0.2% of 8,507. It’s probably no coincidence the number of acquittals in Russian courts is roughly the same percentage. Anyone can end up on the list merely for posting a meme. There is no investigation, no trial, no explanations. Wham! Just like that you’re a “terrorist,” a lowlife excluded from modern society. * Since Mr. Volkov wrote this post, two days ago, Rosfinmonitoring seems to have added another nine people to the list. The Presidential Human Rights Council (PHRC) plans to find out who the Cossacks were who scuffled with supporters of Alexei Navalny during the unauthorized protest rally on May 5 in Moscow. Meanwhile, the Moscow mayor’s office and the Central Cossack Host claimed they had nothing to do with the Cossacks who attempted to disperse opposition protesters. Kommersant was able to talk with Cossack Vasily Yashchikov, who admitted he was involved in the tussle, but claimed it was provoked by Mr. Navalny’s followers. Human rights defenders reported more than a dozen victims of the Cossacks have filed complaints. The PHRC plans to ask law enforcement agencies to find out how the massive brawl erupted during the unauthorized protest rally on May 5 in Moscow. PHRC chair Mikhail Fedotov said “circumstances were exacerbated” when Cossacks and activists of the National Liberation Front (NOD) appeared at the opposition rally. “It led to scenes of violence. We must understand why they were they and who these people were,” said Mr. Fedotov. “Our main conclusion has not changed: the best means of counteracting unauthorized protest rallies is authorizing them,” he added. On May 5, unauthorized protest rallies, entitled He’s No Tsar to Us, called for by Alexei Navalny, took place in a number of Russian cities. In Moscow, organizers had applied for a permit to march down Tverskaya Street, but the mayor’s officers suggested moving the march to Sakharov Avenue. Mr. Navalny still called on his supporters to gather at Pushkin Square, where they first engaged in a brawl with NOD activists and persons unknown dressed in Cossack uniforms. Numerous protesters were subsequently detained by regular police. Approximately 700 people were detained in total. Bloggers have published information about the Cossacks they have been able to identify from photos and video footage of the rally. One video depicts a bearded man who grabs a placard, bearing the slogan “Open your eyes, you’re the tsar’s slave!”, from a young oppositionist before arguing with Open Russia coordinator Andrei Pivovarov. The Telegram channel BewareOfThem reported the man was Vasily Yashchikov, member of the Union of Donbass Volunteers. Mr. Yashchikov has confirmed to Kommersant he was, in fact, at the rally and was involved in the brawl with opposition protesters. Yet, he claimed, most of the Cossacks at Pushkin Square had nothing to do with the Central Cossack Host, as claimed by the Bell. According to Mr. Yashchikov, the brawlers mainly consisted of nonregistered (i.e., unaffiliated with the Russian government) Cossacks from two grassroots organizations, the First Hundred and the Crimean Regiment. Moreover, they allegedly showed up at the rally independently of one another. He admitted there were several people from the Central Cossack Host at Pushkin Square, but his group did not interact with them, either. According to Mr. Yashchikov, the Cossacks came to Pushkin Square to talk with Mr. Navalny’s supporters, but had no intention of being involved in dispersing the rally. “There were one and half thousand people there [the Moscow police counted the same number of protesters—Kommersant]. There were thirty-five of us at most, and we had only two whips. You could not have paid us to wade into that crowd,” claimed Mr. Yashchikov. Mr. Yashchikov claimed he managed to have a friendly chat with Mr. Navalny, but opposition protesters were aggressive, he alleged. People who attended the rally have denied his claims. Darya planned to file a complaint with the police charging the Cossacks with causing her bodily harm. Currently, human rights defenders from Agora, Zona Prava, and Public Verdict have documented more than fifteen assault complaints filed against the Cossacks. Oppositionists have claimed the police mainly detained protesters, allegedly paying almost no attention to the Cossacks and NOD activists. Kirill Grigoriev, an Open Russia activist detained at the rally, recounted that, at the police station where he was taken after he was detained, he pretended to be a NOD member, and he was released by police without their filing an incident report. “When we arrived at the Alexeyevsky Police Precinct, a policeman immediately asked who of us was from NOD. I jokingly pointed at myself. He took me into a hallway and asked me to write down the surnames of other members of the organization,” said Mr. Grigoriev. He wrote down the surnames of ten people, after which everyone on the list was given back their internal Russian passports and released. He’s No Tsar to Us, the unauthorized protest rally in Moscow held by Alexei Navalny’s supporters, differed from previous such rallies. On Tverskaya Street, provocateurs demanded journalists surrender their cameras. By 2:00 p.m., the monument to Pushkin was surrounded by activists of the National Liberation Front (NOD). When protesters chanted, “Down with the tsar!” they yelled “Maidan shall not pass!” in reply. Behind the monument were groups of Cossacks, who had never attended such rallies. In addition, for the first time, the police warned people they intended to use riot control weapons and physical force, and indeed the actions of the security forces were unprecedentedly rough. The riot police (OMON) detained protesters by the hundreds, and Cossacks lashed them with plaited whips. The Moscow police counted 1,500 protesters at the rally, while organizers failed to provide their own count of the number of attendees. Navalny said the nationwide rallies were a success. His close associate Leonid Volkov argued that “in terms of numbers, content, and fighting spirit, records were broken,” also noting the police’s unprecedented brutality. According to OVD Info, around 700 people were detained in Moscow, and nearly 1,600 people in 27 cities nationwide. Citing the PHRC, TASS reported that 658 people were detained in Moscow. PHRC member Maxim Shevchenko demanded the council be urgently convoked due to “the regime’s use of Black Hundreds and fascist militants.” According to a police spokesman, the appearance at the rally of “members of different social groups” was not engineered by the police, while the warning that police would use special riot control weapons was, apparently, dictated by the choice of tactics and the desire to avoid the adverse consequences of the use of tear gas. According to NOD’s leader, MP Yevgeny Fyodorov, 1,000 members of the movement were involved in Saturday’s rally. “We wanted to meet and discuss the fact the president must be able to implement his reforms. Because we have been talking about de-offshorization and withdrawing from a unipolar world for five years running, but things have not budged an inch,” said Fyodorov. NOD did not vet their actions with the Kremlin, the leadership of the State Duma or the Moscow mayor’s office, Fyodorov assured reporters. On Sunday, the Telegram channel Miracles of OSINT reported that, in 2016–2018, the Central Cossack Host, whose members were at the rally, received three contracts worth nearly ₽16 million from the Moscow Department for Ethnic Policy for training in the enforcement of order at public events. As Vedomosti has learned, according to the government procurement website, the Central Cossack Host received eleven contracts, worth nearly ₽38 million, from the Moscow mayor’s office over the same period. Gleb Kuznetsov, head of the Social Research Expert Institute (EISI), which has ties to the Kremlin, argued there was no brutality at the rally. The Russian government has allied itself with the Cossacks and NOD, which are essentially illegal armed formations, argued Andrei Kolesnikov, a senior fellow at the Moscow Carnegie Center. “This does not bode well. Apparently, in the future, such formations will be used to crack down on protests,” said Kolesnikov. The authorities are preparing for the eventuality there will be more protests. Even now the occasions for them have become more diverse, and they are spreading geographically, noted Kolesnikov. Grassroots activism has been growing, and the authorities have realized this, political scientist Mikhail Vinogradov concurred. They are always nervous before inaugurations. In 2012, there was fear of a virtual Maidan, while now the example of Armenia is fresh in everyone’s minds, he said. “The security services had to flex their muscles before the new cabinet was appointed. Although, in view of the upcoming FIFA World Cup, law enforcement hung the regime out to dry contentwise,” said Vinogradov. * In September 2017, the Bell reported that state corporations Rosatom and RusHydro were financing EISI to the tune of ₽400 million each, and it could not be ruled out that the so-called social research institute was receiving subsidies from other state companies.